Third year Ricky Franklin works at 19 Metro Express. Ricky Franklin is a third year, who says he has not been pleased by articles from the Mustang Daily. He works at 19 Metro Express, and would like to set a few things straight. Q. What has the Mustang Daily said about campus food? A. The Mustang Daily said there is no nutritional value in the food options, therefore, we are putting the customer at a disadvantage. Although, as you can see, there are parfaits and fruit and vegetable cups available. Q. Did you like the food when you were a freshman? I know it’s really hard though for Campus Dining to provide food for everyone. Q. Do you know of any health precautions Campus Dining enforces? A. Yeah, they are big on cleanliness. I know the cooks wear hats or hair nets, and gloves. The food is under temperature control, and everything is dated so nothing can go bad. Q. Have you noticed a trend in what students prefer to buy? Do they go for the healthier snacks? A. No, a lot of people buy the cookies and candy. More people would rather get a cookie with their extra money than something healthy. The fruit cups are the most popular out of the healthy snacks, but on average more cookies are sold. 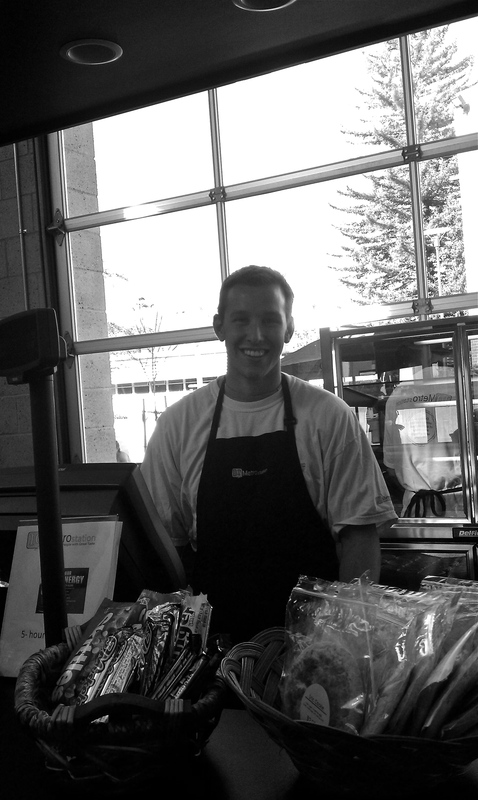 *It also does not help that the baked goods and candies are in baskets right next to the register. This is tempting, and easy to grab when you have a few extra dollars to spend. Q. Who prepares the baked goods and pre-made food? A. The Cal Poly Campus Dining prepares it all. They make and package the baked goods and all the fruit cups too. Isn’t it reassuring to hear all the baked goods are made on campus? The good news is that the package labels show the treats are made with the basics: sugar, flour, salt, chocolate etc. It seems as though Campus Dining tries to incorporate healthier food options out in the dining halls with the fruit cups and parfaits. Unfortunately, with the temptation of cookies and chocolate bars lingering around the cash register, who wouldn’t want to grab one? Ricky is not the only one displeased with dining rumors. The question seems to be, who is creating them? A worker at the Sandwich Factory (who has asked to be anonymous), confirms that there is a bake shop. Q. Where does the food come from? A. The baked goods are from the bake shop downstairs or we do get some of it from Edna’s Bakery. And the produce is from a local wholesaler called All About Produce; it comes fresh everyday. Q. Are there nutrition standards? A. Nutrition is posted online, so students can view it there. And the anonymous worker said I would need to talk to a manager or PR personnel for answers on health and other nutrition. 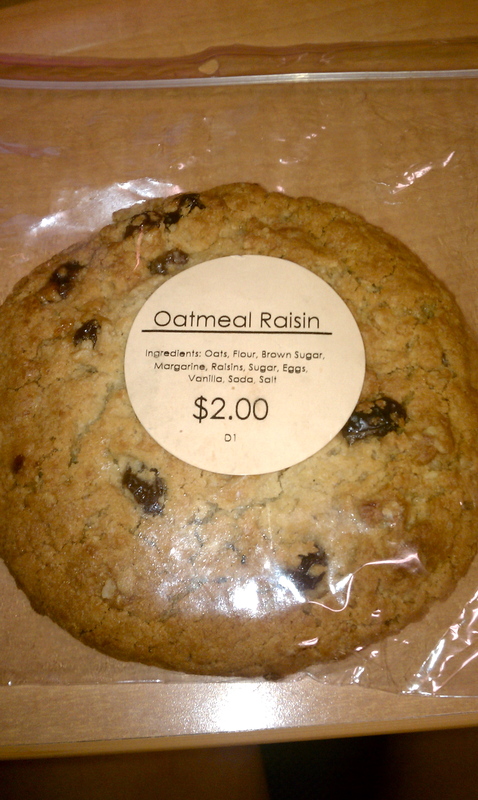 One type of cookie students can find on campus. The picture on the left is one of the baked goods Cal Poly bakes on campus. These giant cookies are offered in other types such as white chocolate macadamia nut, chocolate chip, snickerdoodle, carnival (M&M’s), and peanut butter. Other popular baked goods are mini bread loaves one can find at the Sandwich Factory. Although it is viewable online, would it not be more beneficial for students to see it in the restaurants themselves? If they are present there, more students can make healthier decisions on what they eat. Jessica Bulletset and Carrie Glaser are prime examples of students who never look at nutrition facts and sometimes have no idea they are even available. Jessica is a third year and majoring in the School of Agriculture. “I liked certain places as a freshman, but I ate a lot of salads and stuff since you can’t really make a salad taste gross you know? Salads are what I spent my meals on,” said Bulletset. Carrie Glaser is a first year graphic design major, who likes to spend her plus dollars at Starbucks. “I usually get plain black coffee because you get it right away, not because I know it’s nutrition facts. As for the pastries, I like getting a lemon poppyseed scone or the lemon bread. I never look at the nutrition, but I expect the scones and muffins to be high in calories but not in fat,” said Glaser. It seems reasonable to say that most of the students don’t look at the nutrition online. Do you think if it was visible in the campus restaurants, students would change their decisions on which foods to buy?